1 Visiting Disney World with Toddlers? 7 Stop 26. Tom Sawyer Island. 12 Stop 23. The Seas with Nemo and Friends Shark Play Area. 14 Stop 28 -ish. A hodge podge of fun. 16 Don’t miss TOY STORY MANIA ride. 18 Stop 42. The Boneyard Playground. 21 Disneyworld for toddlers? Share your finds! Visiting Disney World with Toddlers? Want a Comprehensive List All the Playground Retreats INSIDE the Four Theme Parks? OMG. I wish someone had handed me this list before our vacation at Disney World. As a solo mama travelling with two boisterous boys aged 6 and almost 2, PLAYGROUNDS are my “knight in shining armour”. It’s a happy time out for EVERYONE. So, from one mama to another, here’s a list of what you really need to know about when taking the kiddies to Disney World. The hot tips on where you and they can take a happy break to avoid the massive meltdowns, the sugar highs, the over-stimulated fits of rage, and sore feet. Just pull out your park map and take note of the stops at each park to take time out from the crowds, to ensure you really do have the best time at the “Happiest Place on Earth”. Just underneath the Walt Disney World Railroad, there is a small soft-floored playground called “The Laughing Place”. The enchanted forest-like play area is designed for littlies up to about aged 4, but my 7 year old thought it was pretty cool too. We stopped there during a massive rainstorm and weather ‘event’ that closed all the outdoor rides so it was packed with kids, who decided it was just the right place for a game of hide-and-seek. With tunnels to run through, large open ‘windows’, hidey holes, and a small slide, complete with a small area out the front in which to run, it was game on. There’s no specific ‘seating’ there for parents but we all made do, perching on the short wall-like fence that separates the playground from the main traffic heading under the bridge. It’s right near Splash Mountain too, so if you have one parent waiting for the rider switch, this is a good spot to hang. Good for a contained ‘run’ up the tree and back. The path is all in one direction with no chance for them to slip out unawares. If there’s two of you, position one of you at the exit then let the kids go, with one adult free to follow along if you feel like it. The ‘tunnel’-like walk is completely contained with rope-mesh borders. The kids aren’t going anywhere but following the path- it is quite a rigorous climb AND the perfect antidote to queuing and there’s plenty of kid-friendly intrigue and stuff to see along the way. Stop 26. Tom Sawyer Island. Who doesn’t want to visit Tom Sawyer Island when they go to Disneyland? When you disembark, go left to head towards the mystery tunnels that wind in and out and all around in semi-darkness. My boys thought this was a hoot. Just be sure to keep up! A bit further down, we came across an ‘abandoned’ miner’s camp, “Fort Langhorn”- if you are looking to run off a bit of energy, then the hundreds of stairs including spiral staircases and mystery trapdoor exits here will suit your purpose. If you are a mum/mom who does not want to encourage ‘gun play’, stay away from the hideouts on the top floor of the log buildings. My explorers found these, and of course wanted to spend time ‘shooting’ the passengers (invaders) on the Liberty Belle, alongside a few burly men who seemed to be reliving their childhood cowboy duels with KAPOW Boom! sound effects galore! Run back across the rope bridge to the other side of the island to find the Tom Sawyer Scavage Fort play area too. There’s plenty more to discover on this side too. Whether you have girls or boys, don’t miss it. There’s also two other spots to mention in the quest for playground time-outs: interactive queues at both Dumbo and Winnie the Pooh rides. This must be one of Disney’s best inventions yet. First up, the kids are invited into a circus-themed tent where they can climb high up and wind through rope mesh corridors on an adventure quest, slide down tunnels, and push their way through obstacles. Mums and dads can sit on the bleacher seating in the tent post to Instagram while keeping half an eye on the older kids. Toddlers and super young children have their own little area with a button-pressing fire truck, mini slide and an oversized puzzle inside a round enclosure complete with bench seating so parents can stay close. Parents are given a beeping pager upon entry and when it’s your turn to fly with Dumbo, it will beep and flash to call you in. BONUS – the time in the waiting area is included in the wait time posted in front of the attraction. This ride is a triple win! – A win for happy kids, win for tired parents, AND a win for social media accessibility! The famous DISNEY ingenuity is another reason why it’s so easy to visit Disney with toddlers compared to other theme parks too. Hopefully, you have a fast pass for this Winne the Pooh ride in Fantasyland, in which case you will have no need for this intervention. However, if you must stand in line, this has to be the best place for queuing when you have kids in tow. 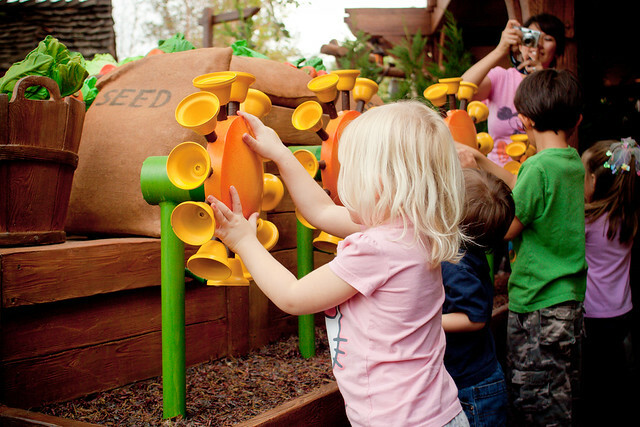 There’s a bunch of kid-friendly interactive activity stations where the kids can play. We loved watching the gooey honey wall where families could ‘draw’ on the screen to make sticky pictures. There’s ball games, a life-sized version of one of those ‘rollercoaster’ toys from yesteryear- where you push each ball along a colourful bendy wire, flowerpot flowers to spin and pumpkin and watermelon ‘drums’ to play. Keeps ’em out of trouble! Stop 23. The Seas with Nemo and Friends Shark Play Area. To the right of the entrance, there’s three noisy seagulls and if you catch them just at the right moment, you’ll hear their squabbles! “Me, me, me” Hilarious! The ride itself is cute, taking a clam shell through the underwater environment of the coral sea (technology is cool too! ), but the highlight is when you come out, surrounded by sea life in the aquarium of the Coral Reef. It’s here where you’ll also find Bruce’s Sub House, a small playground spot with a submerged ship where kids can climb INTO Bruce the Shark’s mouth and wander through a mini maze. This was a highlight of our morning. Even though Epcot is actually filled with quite a few hands-on interactive things for kids to do, sometimes they just want (and need) to roam free, and this was the perfect solution. Enter by the Gift Shop to the Mission: SPACE ride and it’s on your right about 20 metres in, inside the Advanced Training Lab. Stand by the entrance zone and let the kids roam free. There’s buttons to push, hand grips to swirl, and sounds to activate. The playground tunnels and nets span from floor to ceiling and it can take them quite a while to work their way through and you can’t see them at all during the process, except for a momentary glance should they make it to the bubble up top where they might wave at you. But rest assured. So long as you don’t leave the entrance zone, they can’t get out without passing right by you. Side note- I don’t know if I’d have been super keen to go in after him. It looks pretty squeazy in there… perfect for little bodies but not so forgiving to bigger ones. Squash! So it pays to know if your toddler is the kind who might freak out inside at the top. If yes, limit them to the bottom level toddler-friendly playground only. Stop 28 -ish. A hodge podge of fun. We found random and unexpected playgrounds in the area behind Captain EO along the path to Canada (Stop 70). There were two small climbing frame playgrounds in this area, manned by Disney staff. I asked if these were permanent but they said, no, just seasonal- during the Flower and Garden Festival. I’ve heard that they utilise this spot again during the Food and Wine festival too. That’s exactly why Disney with toddlers is so good. They really cater for kids. Pays to keep a look out as you pass by on your way to the restrooms here, just in case. You never know if you will get extra lucky with a quick time-out opportunity. Don’t miss TOY STORY MANIA ride. Don’t miss the Toy Story Mania ride (book a fastpass now- our favourite ride of all four parks!) and you will have a glorious time at one of the Happiest Places on earth. Stop 42. The Boneyard Playground. It’s a HUGE area filled with big twirly spiral slides, a rustic jeep to clamber over, twin slides for toddlers, hide-and-seek tunnels, and dinosaur skeleton replicas housed in what looks like a building site- you know, lots of wire mesh, exposed beams, steel poles, and scaffolding. My boys thought this was cool as! Note: They close the slide area when it rains so if a stormy sky is looming, head there quick smart! The Boneyard digging pit on the other hand stays open even when it rains, so there is always something to do and somewhere to play should the kids need a bit of a stretch and breathe out. Both my boys LOVED this place. Ned gave it FIVE Toadstools- our highest Roam the Gnome rating. It’s a giant pit filled with that rubber ‘sand’, a big heap of green buckets and yellow spades and digging tools (enough to make sure EVERYONE has one! Yay, Disney!) and a hidden dinosaur skeleton to exhume. Plenty of rock crevasse seats for weary mum-bums (and dad bums too). Disneyworld for toddlers? Share your finds! 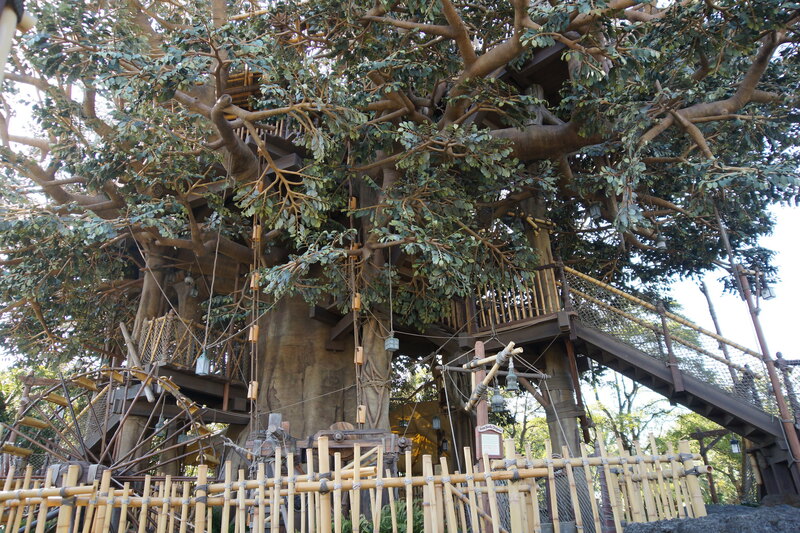 Do you know of any more “secret squirrel” play spots for kids at any of the four Disney parks? Share your secret tip in the comments!